• Most guests mispronounce the name of the castle, making it possessive. It is Cinderella Castle, not Cinderella’s castle. • How many stones make up the iconic castle? None. It is made of fiberglass and gypsum plaster. • The mote surrounding the castle contains 3.370 gallons of water. • One of the prime restaurant reservation’s is for Cinderella’s Royal Table, a character meal featuring the princesses located on the second floor of the castle. • An apartment suite for Walt Disney and his family was to be built in the castle. Unfortunately, Walt died before its completion. And the space was used for storage and offices. In recent years, the space was renovated to become the Castle Suite, a fantastic prize given away to unsuspecting guests during the Year of a Million Dreams promotion. • The Castle also uses forced perspective techniques. • There are a total of 27 towers on the castle, each numbered 1-29. Tower numbers 13 and 17 were deleted before construction when it was realized that they could not really be seen from anywhere in the park, due mainly to the other Fantasyland buildings. The tower with the clock in front is 10, the tallest is 20. 23 is the other golden-roofed tower. • The shingles on the towers are actually made of the same type of plastic that computer monitor shells are made from. • At Christmas, the castle is covered with over 200,000 LED lights. • Inside the castle's archway, a series of five mosaic murals tells the story of Cinderella The murals took 22 months to complete and contain just over 300,000 pieces of Italian in more than 500 colors. Many of the hand-cut tiles are fused with sterling silver and 14 carat (58 percent) gold, and some are as small as the head of a tack. Each of Cinderella's wicked stepsisters appears with a little added color - one sister's face is clearly "red with anger" while the other is a little "green with envy" as they watch Cinderella try on the glass slipper. • The Disney family Coat of Arms is on display at the front at back of the castle. • There is a three circle design on the fence so when the sun is right, it makes Mickey shadows on the sidewalk. The central rose was added later to prevent curious children from poking their heads through the fence and getting stuck. • Be sure and notice the beautiful detailing on the columns as you walk through. You will find all of Cinderella’s forest friends. • Behind the castle you will find a fountain with a statue of Cinderella behind it. When you have a drink from the fountain you will notice that a crown from the mural behind her magically appears on her head. • One of the flagpoles on the castle has an artificial flag that actually transmits signals to the floats coming down Main Street in the parade. • Be sure to watch Tinkerbell fly out of the castle during Wishes. If you look during daylight hours you can see her guide wire. Peter Pan explained to one guest it was so she wouldn’t get lost. • The castle was designed based on Neushwanstein Castle in Bavaria. 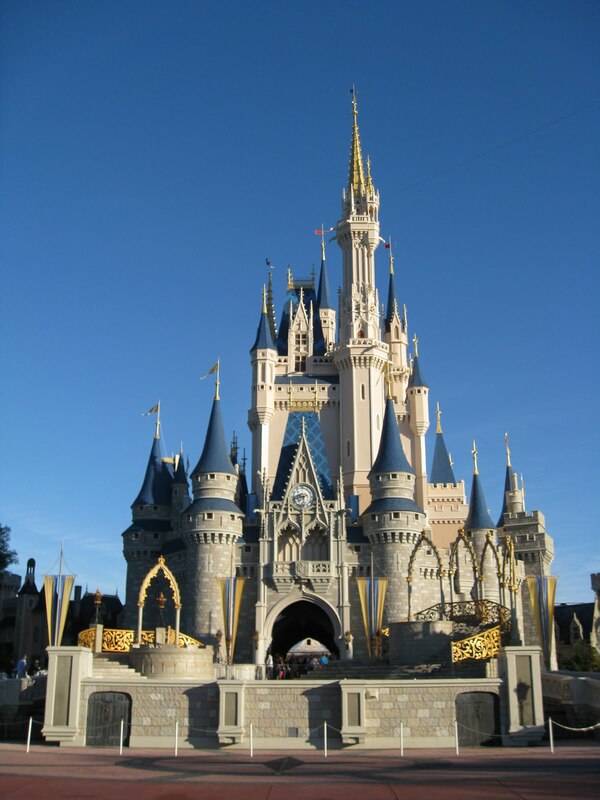 • Contrary to popular rumor, the castle cannot be moved or dismantled for a hurricane. 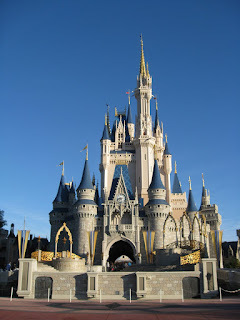 • The Castle is 189 feet tall. Why? It is tall enough to be seen from outside the parks and from the monorail, but just less than 200 feet which would require a blink red light on top to warn low flying aircraft. • The castle took 18 months to build.